"Tameka Corner" is a new lifestyle & travel blog showcasing all things fabulous! We chat about Business, Beauty, Travel, Family, and a host of other things that make my corner of the world so special! Look forward to product reviews, favorites lists, useful info, and tons of laughter and smiles! 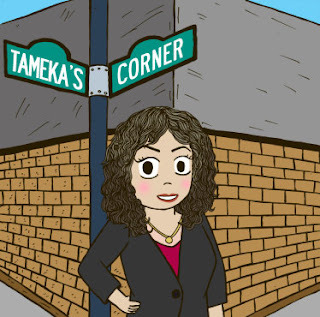 Take a few moments to get away from it all and join me in my corner of the world, Tameka's Corner. EARTH DAY!! One of my favorite celebrations! 3 ways you can help relieve the burden we've placed on the Earth! Celebrate Your Upcoming Graduate… Dollar Tree Style! Pinterest Blog | Oh, How Pinteresting! The site does not provide medical or legal advice. This blog site is for information purposes only. Viewing this site, receipt of information contained on this site, or the transmission of information from or to this site does not constitute a consultant-client relationship. The lifestyle and/or nutritional information on this site is not intended to be a substitute for professional medical advice, diagnosis, or treatment. Always seek the advice of your physician or other qualified health provider with any questions you may have regarding a medical condition. Never disregard professional medical advice or delay seeking it because of something you have read on this website/blog. Reproduction, or translation of materials in this Website without the author's written permission is prohibited. No content may be reproduced without the express written permission of the author. A hyperlink from another website to this site is permitted. Copyright © Tameka Cooksey Horton. Travel theme. Powered by Blogger.